Anyone else having trouble finding this week's pattern like I am? Karen - try this link - she posted a reprint with some corrections right below the first paragraph. 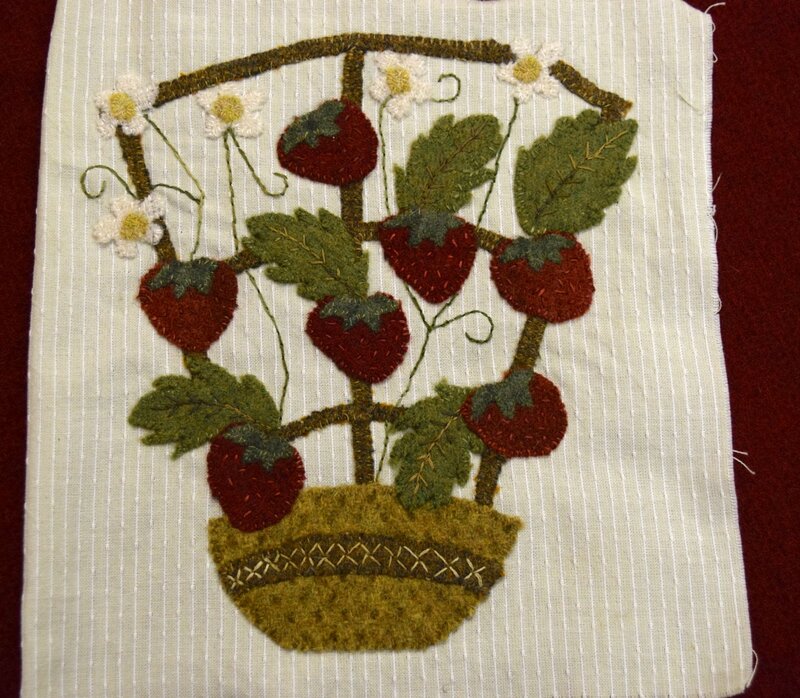 This week from Rusty Crow - love the strawberries Free pattern link is on the right just below the newsletter signup button. I'm back from retreat and getting caught up. How many block patterns should we have saved now? Has anyone actually started stitching? You should have six blocks saved now, Nancy. Okay, looking back for the one I missed... Thanks! Super cute! Love the watering can! Thanks Barb, for keeping us up to date. So has anyone started this? I see a quilt-along group going for the bright summer wool BOM, but haven't seen anything posted here. I'm going to guess that you all are waiting for all the blocks to be revealed so that you can figure out what color scheme you want to go with, right? That's my plan! Nancy, I've been saving them all, but right now working on the summer bom and the little Attic Heirloom ornaments. That's about all the wooly things I can handle right now. Waiting for a color scheme is a good idea. 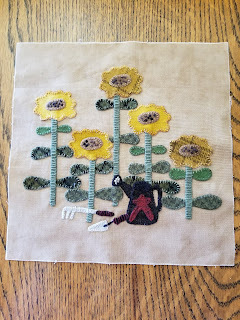 This weeks block, sunflowers to get you dreaming of summer, from Geoff's Mom blog here. Have fun.